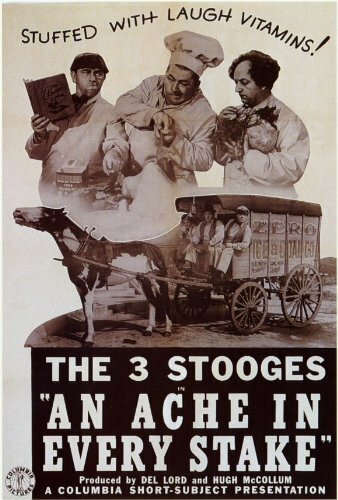 An Ache in Every Stake is one of the Three Stooges’ funniest short films, starring Moe Howard, Larry Fine and Curly Howard. The film begins with the Three Stooges as ice vendors. The film came out in 1941, before refrigeration was common. They have to deliver a block of ice to a mansion, where the occupants are preparing for a fancy birthday party. Out of the gate, there’s a problem. It’s a hot day, and Curly has been sitting in the back of the ice truck with a block of ice on his head to stay cool. Only to have the block melt and refreeze around his head. Moe and Larry help him get it off with a hammer and chisel, in a comic scene that has to be seen to be appreciated. In the process, Curly goes flying into an innocent bystander (Vernon Dent), knocking him and his birthday cake to the floor. Stooges regular Bud Jamison has a small role as the baker, who helpfully reminds Dent “I told you to be careful.” Curly then takes a cake of ice up the top of the stairs, but by the time he gets up the massive stairs it’s melted down to a small cube. Moe has him try it again, having him take up two cakes, ending up with two cubes. Eventually, Moe decides that since they can’t get the cubes to the icebox before they melt, they’ll bring the icebox down to the truck. The do, and even load the ice cake in the icebox without mishap, and begin taking the icebox back up the stairs, with Curly as a pack mule. Unfortunately, the Stooges have neglected to secure the icebox door, and the cake of ice falls out, rolling down the stairs, knocking over Vernon Dent and another birthday cake. The Three Stooges flee into the house for refuge, and shortly drive the chef into quitting. The lady of the house then makes a major mistake — she hires Moe, Larry and Curly as replacement help. Curly stuffs a turkey as only he can – a wonderful comic bit, as he takes the recipe too literally; my favorite is “diced potatoes.” In the meantime, Moe is baking a cake. When it falls, he decides to inflate it with gas taken from the kitchen oven. When Vernon Dent finally comes home, with cake on his face and a bad mood, he’s in no mood for a birthday party, but he tries anyway. 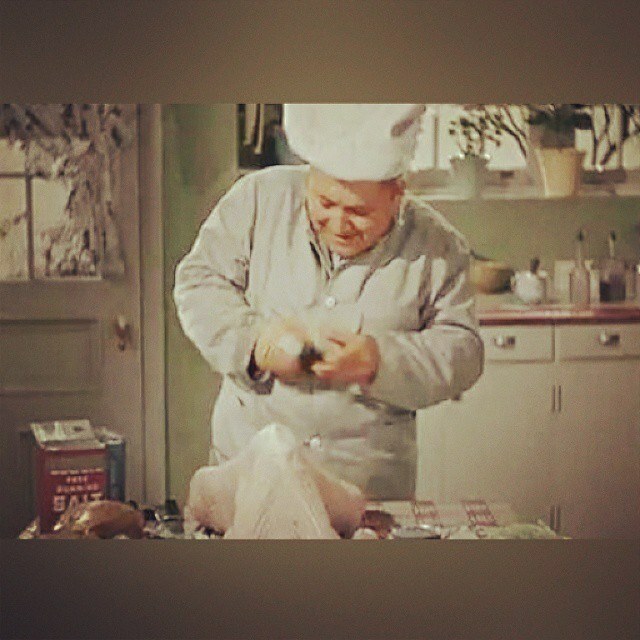 Until he tries to cut the gas-inflated cake, with an icing-laden explosion, and the Three stooges getting away by riding their icebox down the stairs to their waiting getaway vehicle. A very, very funny Three Stooges short, with Curly at his finest. It is available on DVD as part of The Three Stooges Collection, Vol. 3: 1940-1942.